We have just received the MLB 14 The Show fact sheet. It's definitely much smaller than any previous year. UPDATE: Was just notified this isn't the full fact sheet. It will be released on Monday. 2014 marks the debut of MLB 14 The Show on the PlayStation®4 system, harnessing the platform’s next-gen horsepower to deliver an unmatched presentation. Player models benefit from huge advancements in detail, down to the finest hairs on their heads. Photo- realistic stadiums boast four times the texture resolution, with each scene jumping in polygon count from 150,000 to over 1 million. Vastly improved 3D crowds are more lifelike and varied than ever; 42 different crowd member models jump to 1,000 on the PS4 system, each of which are comprised of 10,000 polygons, up from 1,600 last gen. A wealth of new animations, grass rendered down to the last blade, new intro fly-ins, and many other enhancements on the PS4 system bring the atmosphere to life more effectively than ever. Over 40 additions, improvements, and innovations abound this season, including: Quick Counts offer full season enthusiasts a chance to cut the duration of a complete game in half with statistically generated pitch counts; Year-to-Year Saves complement the existing Cross Save feature, ensuring the time invested in 2014 can be carried into next year’s game; Online Franchise, coupled with vastly improved netcode, makes it possible to share the thrills and surprises of The Show’s acclaimed Franchise mode with other fans; and Universal Profile, which builds a virtual manager based on the user’s tendencies and tactics, allowing for more meaningful online competition when one player can’t participate in real-time and needs a simulated version of themselves to fill in. Loaded with a slew of heavily anticipated enhancements—which also include a completely rebuilt, extremely responsive UI and a refined Road to the Show mode—this year’s entry in the heralded franchise is unequivocally the definitive baseball sim, handily proving that the best place to play America’s pastime in 2014 is on PlayStation. Next Generation Baseball Has Arrived – MLB 14 The Show makes its next-gen debut on the PS4 system, utilizing the system’s vast resources to deliver exceptionally detailed and fluid gameplay. With improvements to presentation, a wealth of added animations, and a dramatic increase in environment and player detail, we are setting out to create the best-looking and best-playing baseball sim ever created. Year-to-Year Saves (All platforms) – For the first time in franchise history, saves can be carried over from MLB 14 to future releases of The Show, meaning that gamers won't have to worry about starting their Franchise or Road to the Show seasons over in years to come. Player Lock (All platforms) – The new Player Lock feature (a.k.a RTTS anywhere) gives users the ability to lock-on to any single player and enter games using the Road to the Show gameplay mechanic, allowing for faster games and more focused on-field action. Quick Counts (All platforms) – Users will now be able to play a full nine-inning game in less than 30 minutes, half the time it takes in previous iterations of The Show. Despite the shortened game durations, realistic stats will not be compromised. Universal Profile (PS3 & PS4) – A new tendency-tracking system monitors and records gamers’ unique playing styles. Those patterns are stored in the Universal Profile, which can be viewed by anyone looking to get a quick scouting report on the player. The Universal Profile can also be subbed in in place of a CPU opponent in Diamond Dynasty and Online Franchise, making for more realistic head-to-head matchups when schedules prevent synchronous play. Community Challenges (PS3 & PS4) – Players will be able to freely toy and tinker with game situations and scenarios on the fly, whether that’s the inning, score, who’s on base, or where the ball is hit. These custom situations can be bundled with a creative set of goals and put forth as a challenge to the community, whether it’s to relive the past, change history, or dream of new possibilities. Online Franchise (PS3 & PS4) – Finally, Franchise mode can be shared with friends online, with most of the features from the offline version making the transition, including Scouting, the Amateur Draft, Free Agency and CPU Trades. The mode will remain highly customizable as scheduling, divisions, postseason spots and more are all commissioner options. Stubs (All platforms) – Playing games in MLB 14 The Show rewards players with Stubs. Stubs can be used to purchase additional in-game content – like Road to the Show training points – or used in our new mode, Community Challenges. Stubs can be earned in any mode, and they are not required to progress through a mode. You can still purchase additional in-game content through the PlayStation Store. Diamond Dynasty Extra Innings (PS3 & PS4) – In this mode, a player’s team is always looking for opportunities to challenge other users in an offline setting, which allows the user to earn bonus rewards the next time they log in. When online, the player has the opportunity to challenge other user-created teams in an offline game where the CPU controls their team. Players can only benefit positively in this mode even if their team does not perform up to their normal standards. But there is another fact sheet with much more of the little details that Russell writes up as well correct? For some reason I thought there were 2 fact sheets this one and the biigger one for us OP readers. Was just notified this isn't the full fact sheet. It will be released on Monday. So we'll call this the mini-fact sheet, lol. Whew. 1) I think the screenshot above is my favorite out of the PS4 screens we've seen. It really shows off the texture of the letters/numbers. Also, his throwing arm looks unbelievably good. 2) Don't see anything in the Fact Sheet about RTTS, this leads me to believe there will be a lot of new RTTS info coming in the future. 3) Stubs (aka "the Dreaded Universal Currency") actually sounds really great, in my opinion. Intro fly-ins. This could be really nice! You beat me too it. i was just about to say the same thing. What does that mean? Blue Angels doing a fly-over or do they mean like aerial shots of the stadiums at the start of the game? Another year, another fact sheet completely devoid of any information regarding the Vita version (I realize this is a mini fact sheet, I don't expect much more in the full one). 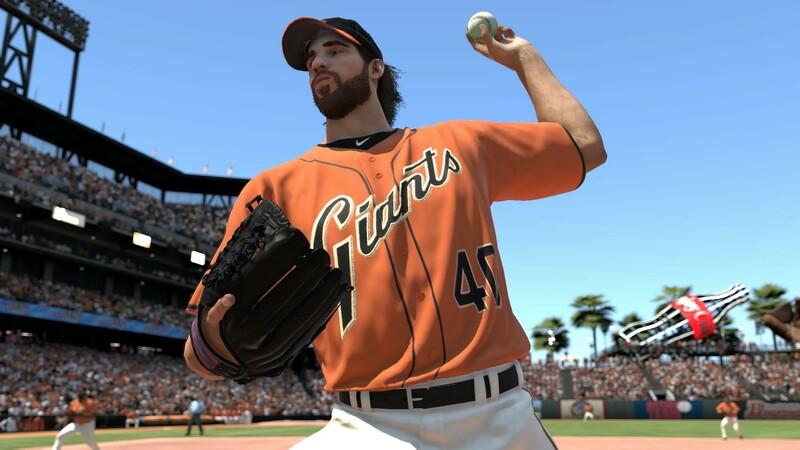 I'm hoping for the lost Owner Mode-like aspects stripped out of MLB 13 to return in a more streamlined form for MLB 14. It would be nice to have some more Commissioner options too, like being able to balance the 30 team schedule, so those who prefer to play against all the teams, at all the stadiums instead of so many games against the same teams can do so. I love the idea of intro fly-ins too, it really helps sell the park exisiting in a larger space. Hopefully it starts outside the stadium in aerial view and takes you inside the stadium and pans around. Could be really nice to set the tone of the start of the game. Can't wait to play online franchise. Everything sounds kosher but this sounds a little overkill. Just imagine the sick patterns they could do with the grass, if the grass is really detailed it would only make the patterns look that much better. Grass is actually an important component of the game. The Universal Currency ("Stubs") isn't required to advance through modes, only helps if you want it! Whew, this is great news! Hopefully people can step off the ledge now! I had the same reaction when i read that.